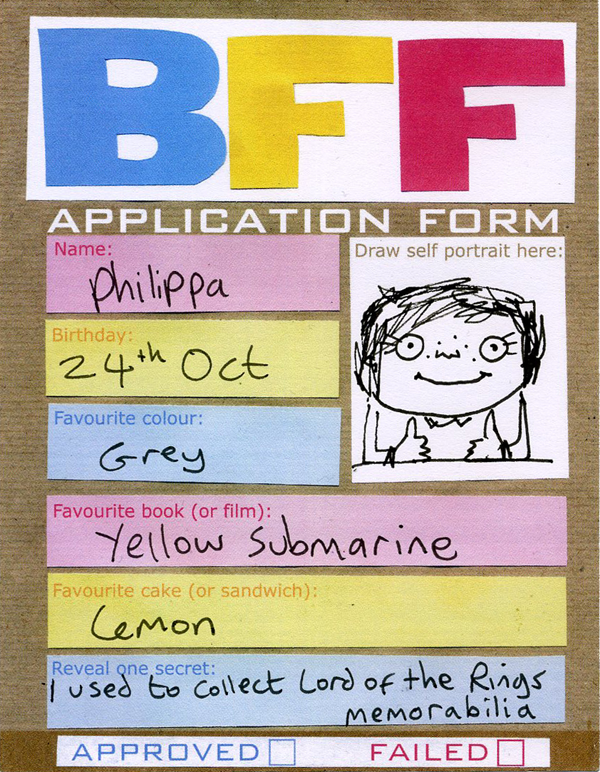 It’s the BFF application form. This one’s been completed by me! Approve me or fail me at your own discretion. I designed these forms several months ago and they’re finally available to buy in the shop in the form of a 50 page notebook. Buy one today and start gathering BFF applicants! Here’s a flickr set of all the applicants I’ve collected over the past few months at various events and occasions. All great people! Now devoted BFFs. A sassy interview with me on the Thought Bubble blog. As well as the BFF forms, I’ve added other new comics and things to the shop, so go and have a look around if you like. London MCM Expo is next weekend! It coincides with Halloween. I am preparing a costume! i’d approve you, not least because we share a birthday. happy birthday to us for tomorrow! yay! Birthday twins. Happy Birthday to you! I love the BFF applications! I should move to the UK just so that I can buy them! I guess it’s just giving me problems then. Every time I try to purchase them, it says that it doesn’t ship the BFF applications to the US. Just worked out what the problem was with that and fixed it. Thanks for alerting me to it! Thanks! I just ordered some! Is that birthday real? If so, happy birthday! It is indeed real. Thanks for the birthday wishes! Happy belated birthday, and gray is my favorite color, too! my sister’s birthday was yesterday too! now she’s proudly three years old. Happy Belated Birthday!! My friend has the same birthday as you! I’m so excited, I’m going to the London MCM Expo and I get to meet you! I saw your guest comic for lefthandedtoons! You guys are my favorite web comic artists! Oh my gosh!! Approved!! XD I gotta get me some of those!! howw do we get this formm ?? ?